As the holiday season comes into full swing, many families are out in force to purchase the perfect gifts to bring good will and joy into their loved ones’ lives. Imparting a thoughtful gift onto someone you care about can be hard to top. Those who have gone through the adoption process, though, may face a logistical challenge when it comes to exchanging gifts with the biological or adoptive family. Today’s open adoption practices place an emphasis on positive relationships and clear communication between both families to create a welcoming and trustful environment for the children at the center of everything. A is 4 Adoption is your source for domestic adoption practices nationwide. Our center strives to outperform any adoption agency in California, and we work hard to deliver personalized solutions to each family in order to help create an amazing outcome for everyone involved. Comprised of experienced and professional representatives, our team is here to help in any way we can to improve your experience. 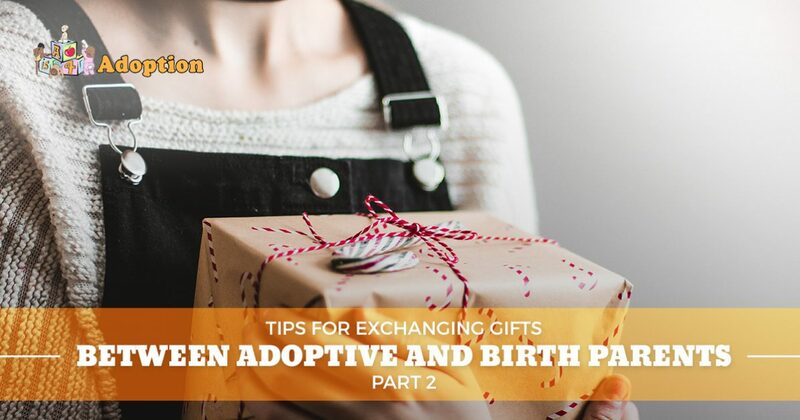 Today, we’ll continue to discuss some helpful tips that may help you when exchanging gifts between adoptive parents and birth parents. When you’re finished reading, be sure to contact us to learn more about our private adoption services. While many people balk at the suggestion of sending gift receipts with the present, it is important to consider this aspect of shopping for everyone’s convenience. Giving gifts is challenging for many people, and when it comes to supplying presents to the kids involved in the adoption process, parents face even more difficult choices. Purchasing clothing can be hard, as you aren’t completely sure as to how the garments will fit on the biological or adopted child. Without knowing the other family intimately, it can be hard to determine what is or is not appropriate for their children. While one family may allow adult-themed music to be listened to by their little ones, the other family may enforce strict rules on the matter. Communicating with the other parents is the first step in getting the right gift, but including a gift receipt can be a handy insurance policy! The unique relationship between adoptive and biological parents creates a social setting where it is important to be respectful, encouraging, and honest. One way to make a big difference in your gift-giving adventure is to include a thoughtful present whenever you can to provide a high level of meaning and caring for the adopted child. Everything from photo albums to handmade gifts can be perfect for bridging the gap and for providing holiday cheer this season. Every child loves receiving the year’s hottest toys, but the long-term enjoyment of these products will pale in comparison to a meaningful gift that provides love and acceptance. Receiving a present is great, but getting one from other family members that truly care about you can make all the difference. The final piece to the complex puzzle of sending gifts to the other family in your adoption circle is that of simply saying “thank you.” The adoptive or birth families have taken time out of their lives to exchange gifts, and showing gratitude for this process can help to make the task all the more worthwhile. Families have a wide range of options for sending thank you cards, ranging from handmade, handwritten notes to elaborate presentations. Your child may show their thanks by creating a work of art, or they may simply choose to write “thank you” on a basic card from the store. Oftentimes, including a photo is beneficial in the thanking process. Giving a gift to a different family may sound like a strange concept, especially when it comes to families connected by domestic infant adoption. Every relationship is different, making it a challenge to foster a positive relationship between the biological or adoptive family in your life. Many families thrive on the concept that their child is bound to this other group, and since they love their child so much, this other clan is included and also treated like family. A is 4 Adoption is here to guide you through every step of the adoption process. Unlike any adoption agency in California, our center focuses on creating a comprehensive care plan for both the birth parents and adoptive parents to ensure a fast, efficient outcome. Our experts have the knowledge and know-how to help simplify this complicated process, reducing your stress while working to find the perfect match for your growing family. Contact us today to learn more about our open adoption services!